The Scottish Deerhound is a very laid-back, relaxed, and calm breed of dog. It is an extremely courteous and well-behaved dog, making it a perfect fit for the home. When it is outside, the Scottish Deerhound loves to sprint and go after anything that budges. However, when it is inside, this breed of dog is very peaceful and needs an ample amount of space to stretch out on a comfortable surface. As a hound dog, the Scottish Deerhound is very independent. However, towards its owner, this dog aims to please. The Scottish Deerhound is particularly sensitive. Around strangers, this breed of dog is friendly but also somewhat shy overall. It is good with children, other dogs, and for the most part other types of pets. However, it may be somewhat curious of strange animals. Coming from the hound family, the Scottish Deerhound needs a decent amount of exercise every day. This exercise can be in the form of a simple long walk or allowing it to run around in a secure area. While physically created to feel natural in outdoor living situations and climates, the Scottish Deerhound much prefers to live inside the house with its family. This dog needs human companionship and compassionate love. In order to avoid calluses, it needs gentle and soft bedding. Because the Scottish Deerhound has such a crisp coat of fur, it needs combed at least once or twice a week. Along with combing, this breed of dog could use some fur trimming to keep its coat straightened nicely. The Scottish Deerhound has a life span of seven to nine years. Some of the major health concerns associated with the Scottish Deerhound are: gastric torsion, cardiomyopathy, and osteosarcoma. Some of the more minor health concerns that this breed has are: cystinuria, and atopy, or better known as allergies. Hypothyroidism and neck pain are occasionally seen in the Scottish Deerhound. To help control these health concerns, it is suggested to take cardiac and cystinuria tests. However, it is to be noted that this breed is sensitive to barbiturate anesthesia. 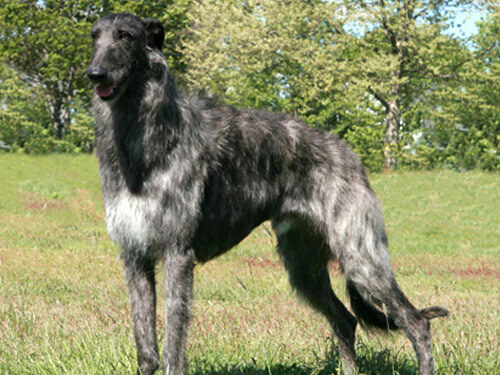 The Scottish Deerhound is one of the most noble of breeds. Since at least the sixteenth century, it has been appreciated for its skill in chasing down deer. It is somewhat difficult to research the specific history regarding the Scottish Deerhound due to its confusion in names. However, it can safely be assumed that it is a very ancient breed, stemming from ancestral Greyhound roots. Similar to its soft-coated Greyhound relatives, the coarse-coated Scottish Deerhound was not allowed to be owned by anyone ranked below the status of an Earl during the Age of Chivalry. However, as the Stag population lowered in England, the bigger, coarse-coated dogs suited for hunting stag became concentrated to the specific area that the stag remained plentiful, mainly in the Scottish Highlands. Here, the Scottish Deerhound were cherished and gathered by Highland chieftains. This hoarding caused the decline of this breed in the mid 1700s following the collapse of the clan system of Culloden. Once breech-loading rifles came into play, the decline of the breed grew larger. However, by the mid 1800s, there was a successful effort to re-establish the breed. After this point, the first Deerhound club was created in England and the first Deerhounds were displayed in dog shows. However, the First World War caused a decline in the breed once again and since the Scottish Deerhound has remained sparse, yet a classic and high quality breed.